Why not try some Moroccan Mint Tea? 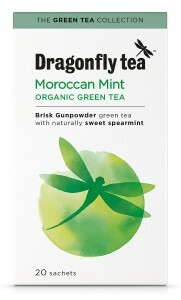 One of our best selling teas is the Dragonfly Moroccan Mint Tea, and it’s easy to see why if you try some! Dragonfly are a family-owned, British tea company with a 100 year history of sourcing, growing and making the very purest and finest organic teas. Dragonfly have a tradition of introducing tea drinkers to new experiences and were actually the first to introduce rooibos and white tea to Britain. Their Moroccan Mint tea is a blend of naturally sweet spearmint leaves from Morocco and gunpowder green tea form China, inspired by Morocco’s rich tea-drinking tradition this refreshing tea is served throughout the day in Morocco both during and after meals. Many tea vendors will add a bit of theatre to the occasion by raising the teapot higher and higher above the tea glass to improve the taste by increasing the oxygen content, just make sure you have a practice doing this before you spill any! This tea has a slightly different twist however with a balance of spearmint leaves with pure gunpowder green tea which gets its name from the dark appearance of the leaves which are rolled by hand into tiny pellets that resemble gunpowder. We’d certainly recommend this tea if you like a delightful afternoon cup in the sun! Previous story Plastic Free July: will you accept the challenge?